22nd 23rd 24th March 2019 – CBO Season Opening Weekend. Due to an expected very low tide, our boat man Philip asked for a prompt departure from Donaghadee at 17:00 on Friday 22nd March to avoid as much as possible any potential of grounding on the other side’s South Landing. Chris Acheson and Peter Smyth packed up the Mermaid with equipment for working on the electrical system, food and some supplies for the weekend ahead. A smooth crossing over and onto the island for around 17:50 was met by a loud reception from a large contingent of various types of gulls. A buzzard was sighted in the air and seemed to enjoy hanging in the wind much like a kestrel would over the west of the island, where it appeared at different stages over the weekend, briefly joined by another larger buzzard for an hour or so on Saturday morning. A few household tasks were taken care of on Friday night with an early willow warbler caught in the heli trap followed by furled nets being deployed in preparation for Saturday morning. A small number of shearwaters were caught on the ground later on after dark, then to bed not too late. Chris made an early start on Saturday catching some chiffchaffs, goldfinches, reed buntings and dunnocks in the nets and whilst the sun made an appearance, the strong easterly wind was a constant presence over the weekend which seemed to slow down the amount of birds arriving. Robins and meadow pipits made an appearance in the nets too. Throughout Saturday, Peter worked on the electrics in an attempt to start the system up after a long winter of low light which resulted in the batteries running totally flat and unable to accept a charge. Unfortunately, the attempts to get the system going again were in vain and another plan is in progress to address via the off grid experts! Last seasons dead bracken was cleared from the ‘Puffin’ slope on the east side looking out to Mew to help with the eagerly anticipated return of these charismatic auks. There were no observations of the Puffins over the weekend, but we hope they are not far away. The slope is in good order with lots of burrows and the decoys all in place, so the next visit should hopefully have some good sightings. A female hen harrier spent some time quartering over Mew on Saturday late afternoon, being mobbed by hooded crows, gulls and even a skein of grey lag geese seemed to give off at her on the way past too. A pair of raven were observed flying between the two islands, they too were given a hard time by the gulls and their crow cousins. Sunday started very windy and with a few squally showers rolling in, the birding was slow with some linnet observed in the air and landing only briefly on the bushes around the walls. A pair of mallard visited the newly filled freshwater pond and seemed to enjoy dabbling around under the surface. A male teal was caught overnight on a wildlife camera at the pond showing a great return to use of the pond after its refurb in August past. Other birds were spotted down at the water’s edge drinking from the pond too, a real testament to the work in the summer. Some more observatory maintenance was carried out indoors during the rain showers and a close eye on the wind was needed as it looked possible that the boat may not be able to get out on Sunday afternoon. Wind measurements of constant force 5 with gusts of up to force 7 were taken, however after some closing activities, the Mermaid came into view around the east side of the big isle in a small window of less pressing winds. The crossing home was choppy but all back to Donaghadee safe and sound for 17:00. A good start, and the observatory is ready for a busy season ahead. 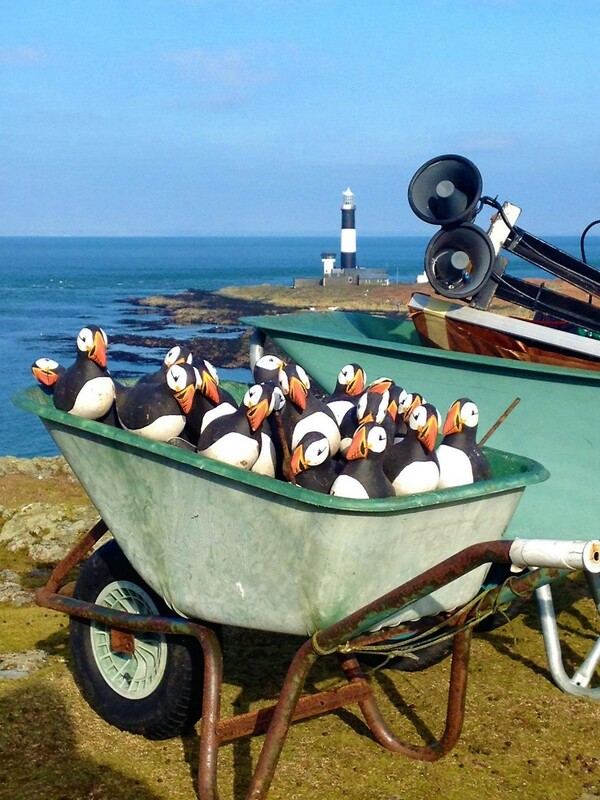 The 2016 season gets off to a flying start with a “Barrow load” of Puffins…..